Intense Pulsed Light (IPL) skin treatments using the photorejuvenation process represent a breakthrough in age-defying skin care. This new technique treats skin damage non-invasively — there is no disruption of the skin’s epidermal surface. 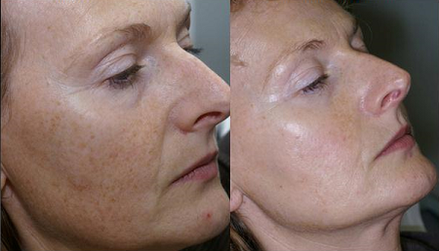 IPL treatments address the effects of photoaging and sun damage with low risk of complications and no recovery time. 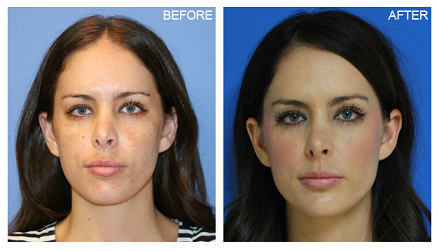 IPL is the gold standard for photorejuvenation. 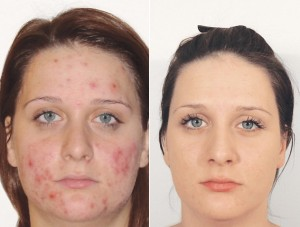 This FDA-cleared, patented technology provides dramatic results for a variety of benign conditions, including age spots, sun-induced freckles, symptoms of rosacea, birthmarks, unsightly veins, acne scarring and other blemishes. Extrinsic aging results from exposure to the environment. 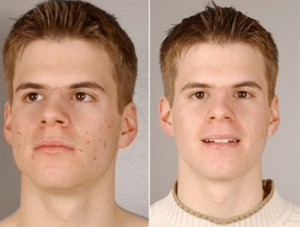 Extrinsic aging is the critical element in determining who looks older or younger than their biological age. Exposure to sunlight is a key contributor to extrinsic aging. 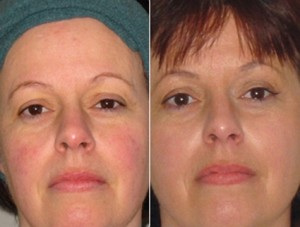 Photoaging occurs when elastin and a collagen breakdown are not replaced, causing fine lines and wrinkles to intensify. 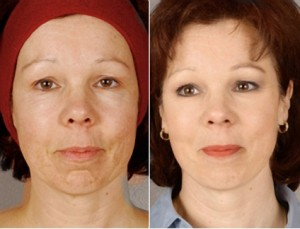 Photoaging also causes pigment changes with development of age spots (sun-induced freckles) and uneven skin tone. 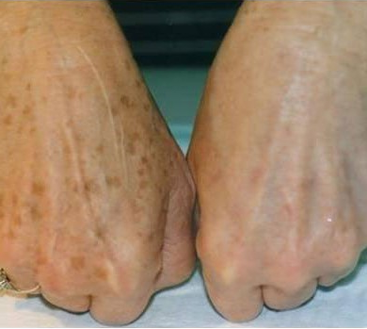 Spider veins and dilated capillaries are another sign of photoaged skin.Lifestyle choices also have an impact on extrinsic aging. Cigarette smoking contributes to the breakdown of elastin and collagen and impairs the body’s healing capacity. 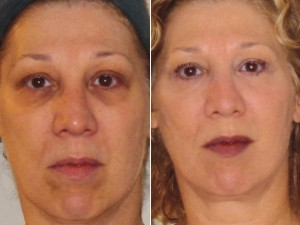 The IPL system releases yellow, green and red lights that are emitted in a series of short pulses. 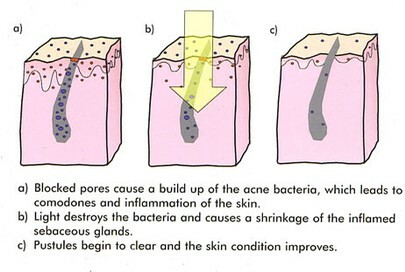 The yellow/green light destroys the bacteria which causes acne that thrives in our skin, while the red light directly targets the overactive sebaceous glands that cause outbreaks of pustules (pimples). The light conversion to heat is targeted accurately to the cells deep in the skin, initiating shrinkage of the inflamed sebaceous glands which helps to prevent over-production of excess sebum. 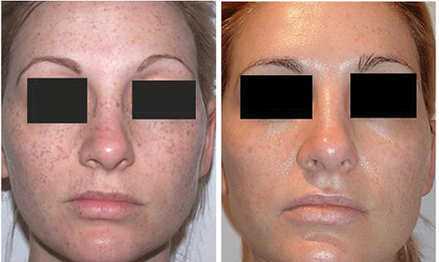 Additionally, IPL treatment is effecting in correcting common skin pigmentation problems such as age spots, sun-induced freckles, and symptoms of rosacea, birthmarks, and unsightly veins, acne scarring and other blemishes. The IPL is a non-invasive proven skin therapy based on emitting high intensity pulses of light to penetrate the skin and lift out various skin imperfections. Sun damage, rosacea, brown spots and most other imperfections of the skin are found lying just beneath the surface of the skin. 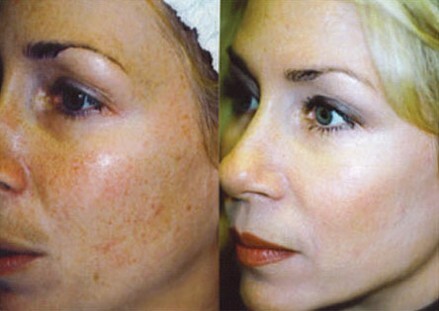 An IPL machine is able to reach these imperfections under the surface of the skin, apply heat to them and destroy them. 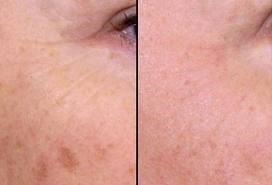 Because the IPL machine is attracted to the colour of the lesions it spares the healthy skin surrounding it. 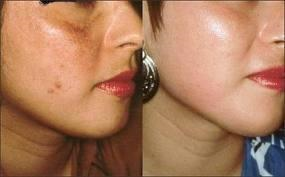 With rosacea, broken blood vessels and other vascular issues, the IPL is attracted to the hemoglobin in the blood. 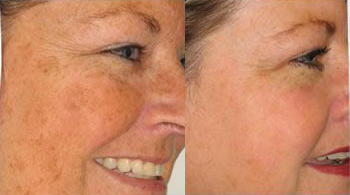 With age spots, freckles, brown spots and sun damage the IPL is attracted to the melanin. With the heat generated a secondary advantage is created. 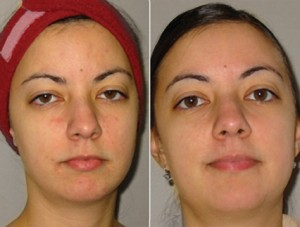 The heat generates the production of new collagen, thereby reducing fine lines and giving an even, brilliant skin tone. Depending on the nature of the condition and the severity of the problem, a series of five treatments is usually recommended. 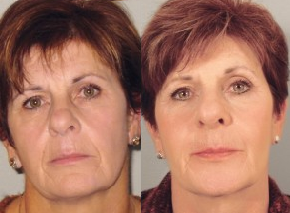 This allows for gradual improvement with very low risk to the skin and little downtime. Treatments are usually three to five weeks apart and can take anywhere from 20 minutes to an hour depending on the area being treated. treatment of red and brown pigment that leaves a smooth skin texture and even complexion, yielding a more youthful appearance.